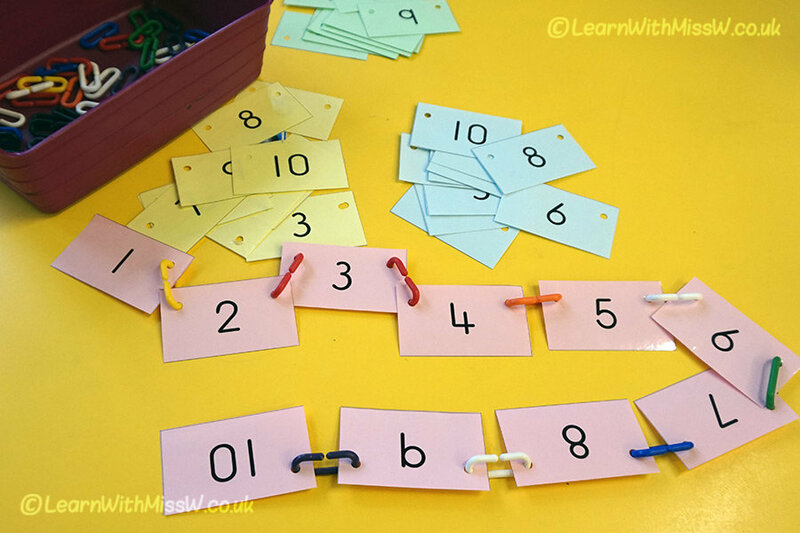 Making sense of numbers to 10 with these number links. Lots of fine motor as well as maths practice as children clip the numbers together. I love the plastic chain links and use them in lots of different activities. It can be a bit tricky to punch the holes in just the right place so the links go on easily and the cards don’t rip. I’m fairly happy with how these ones turned out. The children seem to enjoy this game as they create quite a long chain that they can pick up and bring over to show me. Because it’s a bit fiddly, it usually takes them a while to get it finished as well! I thought the children would want to make a chain of a single colour like my example photo, but I have found they are quite happy to use random colours or make a nice pattern. Now lots of the children are ready to move onto numbers to 20, but I think I will have to buy some more links as I don’t seem to have many left – I suspect some may have disappeared up the hoover!